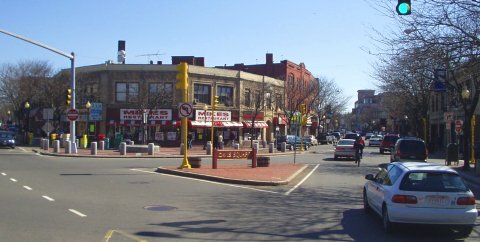 Today we are highlighting the Somerville, MA in Middlesex County. As a bit of a bonus to our just completed 5 Part Series on Boston and the Myth that all parts of the city are still hot, we are looking at this bordering City that usually falls into that same “Super Hot” feeling with people. As emphasized in those posts, some places are still doing well but others aren’t so each area, and market within it, needs to be evaluated on its own. We saw this already this month with Boston border towns of Winthrop, MA and Milton, MA and now Somerville, MA also supports this case. The housing market in Somerville, MA appears to be down significantly since last year. The average listing prices and the average sale prices were both down a very large amount, though the days on market were down a good bit since last year. Inventory was about the same going from 6 sales in May of 2014 down to 5 in 2015. First we are going to look at the average listing price. For Somerville, MA the average listing price in May 2014 was $1,025,083. This was down to $668,560 in May 2015. That gives a massive 34.78% decrease year over year. When I see those kinds of numbers that is when I will make sure to see if the Median prices are much different. In this case I will not do out the numbers here but can just say that the median list price in 2014 was a little higher than the average and in 2015 it was a good amount lower so the drop would actually be quite a bit larger using the medians. Next we will look at the average sale prices. The average sale price for Somerville, MA in May of 2014 was $967,500 and in May 2015 that was down to $673,700. That gives a slightly smaller, but still huge, 30.37% decrease. Taking a look at the median sale prices we see the exact same thing as above with it being larger in 2014 and smaller in 2015, so the fall would be even bigger than what we see here with the average prices. The final metric we are going to look at are the average days on market, which is the measure of how long it takes for a house to sell in the current market. For Somerville the average days on market in May of 2014 were 65.17 and the average days on market for May 2015 were 15.20, for a very significant 76.68% decrease. However, as we have seen many times before in our previous posts for Abington, Bedford, Seekonk, Belmont, Topsfield, Canton, Dracut (Condos), Hamilton, Wakefield, Amesbury (Condos), Dracut #2, Taunton, Reading, Stoughton, Wrentham, Stoneham, Dedham, Nashua, NH, Tewksbury, Brockton (Multifamily), Lowell (Multifamily), Acton, Foxboro, Pembroke, Chelmsford, Beverly, Framingham (Condos), Plymouth County (Condos), Marlborough, Billerica, Waltham, Dracut (Condos) #2, Derry, NH, Framingham, Burlington, Duxbury, Acton #2 , Taunton (Condos), Tyngsborough, Milton, Salem, NH, Boston’s Hyde Park and Boston’s West Roxbury outliers in the data can really skew these numbers. This again is the case for Somerville in May. In this case there was a very high days on market house in the 2014 data. In 2014 there was a house with 243 days on market, which was more than all the others combined and more than 62% of the total days on market for all 6 houses. When removed the new calculation for the remaining 5 houses gives an average days on market of 29.60. Using this adjusted number we see that the very large decrease in the days on market now becomes smaller, but still pretty significant, 51.35% decrease. This does not change the general observation that things are selling much faster than last year, but it does decrease the magnitude of the observation. The Somerville, Massachusetts real estate market has fallen off tremendously since last year. The greater than 30% drops in both listing prices and in sale prices make this very clear. The decrease in days on market is a surprising counter observation though. However despite this nice piece of information for current sellers, it is a small consolation for the tremendous fall in prices. In summary if you are looking to sell a house in Somerville, MA now you should expect to get much less than you would have last year. However, you should also expect it to take a much shorter time to sell compared to last year. Do you need to sell your Somerville, Massachusetts house fast? If you would like to sell your home fast and hassle free schedule a consultation with us today.